Alas, only 200 copies of this were printed, and they are hard to acquire. I only own three, and you can’t have them! For those of you in the trade, there will be many more ARCs with the real cover, at places like Book Expo America. (I’m signing there!) But I love that these silly ones are in short supply. 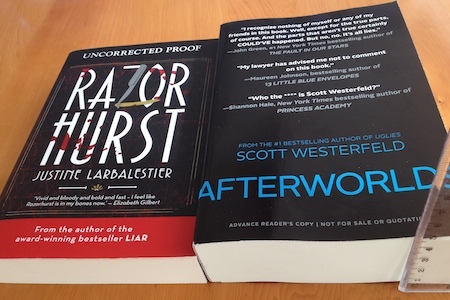 As you can see it’s 5cm (2 inches) thick, almost twice as fat as Justine‘s next book, Razorhurst. Which is her longest book yet. Of course, I’m cheating because it’s really two books (Darcy’s book and the book about Darcy). But still, I win. As sweet as that is, I must point out that many of us fanfic authors would be unimpressed. I for one have written a complete novel that’s around 300k. I’ve seen (though certainly not read) one that’s about 600k. If it’s length you’re wanting to compare, I don’t think most published authors can compete with fanfic. It’s quite freeing not to have to worry about paper costs and book store shelf space. Samus: I dunno. Once you’re at 600k I don’t think paper costs are the issue so much as how do I hold this thing up. Yay ebooks and being able to read online. Well, that successfully made me laugh 😀 And made me even more eager to read it. 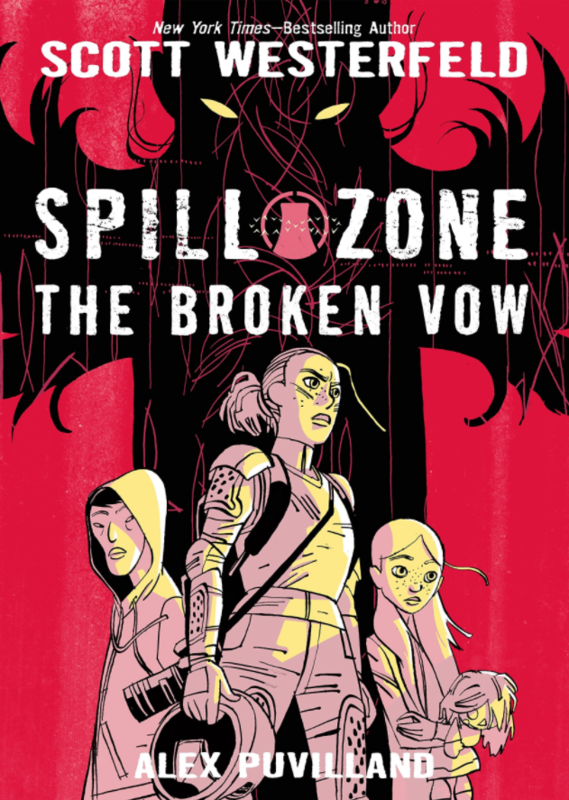 Okay, that is so awesome, I may have to print it and tape it to my copy this fall. Gotta live authors with a sense of humour! If the novel is 25% as awesome as those blurbs, it is going to be an excellent read. I am officially getting excited for this. Will the blurbs still be on the actual book, just not the cover? Now I’m gonna have to rob our local bookstores, geez. Wonder if you even sent any advance copies here (Traverse City) we’re small but unusual. I wouldn’t want to go through the trouble of B&E if there aren’t even any here. I can’t wait for this book to come out 🙂 Love the blurbs, and they just make me want to read it even more! I’m so confused as to the spam. Why has this started happening? Is it spam? It’s just so random. spam? where is there spam? I detect no spam, unless you’re referring to the meat-in-a-can product. I think what you mean by spam good sir/madam/other is traffic. Like, people actually commenting. @15: No, there was spam, but it got deleted. So…do you play the game? Mmmm, I saw spam the other day but it’s disappeared now! 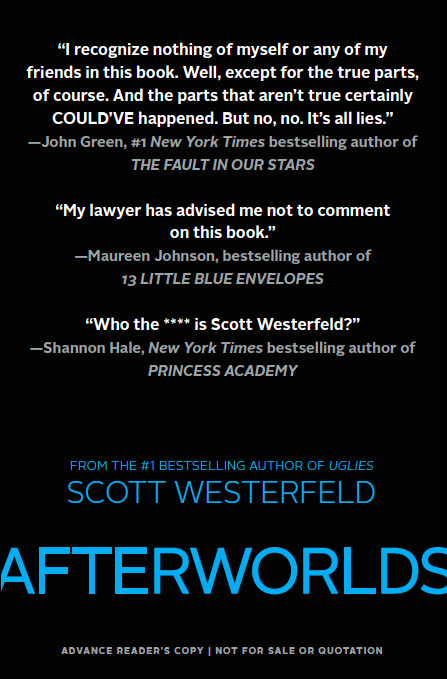 So John Green wrote a blurb for this book?! That’s pretty cool! Do you celebrate Anzac’s Day, Scott? @17: Now I lost the game! @18: You are not. I’m so excited for this to come out! I really, really want one of those. Looks awesome! Gah! I just lost the game. a) why hasn’t there been a blog post for weeks?! b) what is with this spam?! c) are you purposely keeping Uglies TV show news from us?! more for your money people, more for your money. Thank you Scott, for helping me ace my WW1 quiz in history today. I used the afterwords in Leviathan/behemoth/goliath for some solid research. And I greatly impressed my class with the story of Franz Ferdinand’s pocket watch. I need thisssssssssss. I need thisssssssss. Can I buy a bookstore and get one? Pretty please? I just got bullied off of my tumblr for explaining why I didn’t think Leviathan was sexist. Like, Alek and Volger may have been kind of sexist, but the books weren’t promoting sexism, for God’s sake! And saying that “sexism may have been used in Leviathan as a source of conflict, not to promote misogyny” apparently makes me a “gross person?” Well, what do you want, a world where discrimination doesn’t exist? :\ I’m done with tumblr right now. I realized that I’ll disappear from this website for months on end only to appear and make some random, obscure comment…and then I disappear again. Now I shall disappear again. Goodbye, friends, I am gone. Hey, Mr. Westerfeld? Are we getting another blog post anytime soon? Just wondering.